Police are hunting a knifeman who stabbed a woman in the stomach at a house before later ramming a police car as he made his getaway. Cameron Pace, 22, has been named by police as the suspect they want to question in connection with the brutal attack at a property in Tipton, West Midlands. Emergency services were called to the address on Friday morning after a woman suffered knife wounds to her stomach and rushed to hospital. Officers spotted the suspect behind the wheel of a Renault Clio in Brick Kiln Lane, Tipton, at around 6pm that evening. But he rammed the squad car as they tried to apprehend him, leaving both cars badly damaged, before abandoning his vehicle and fleeing on foot. A wanted appeal has now been issued and anyone with information on Pace’s whereabouts is urged to call West Midlands Police. Detective Inspector Dave Sproson, from the force’s Public Protection Unit, said: “If anyone believes they have seen Cameron Pace, or suspects they know where he is, I’d ask them to get in contact immediately. The female victim did not suffer life threatening injuries and was able to return home later that evening after being treated in hospital. 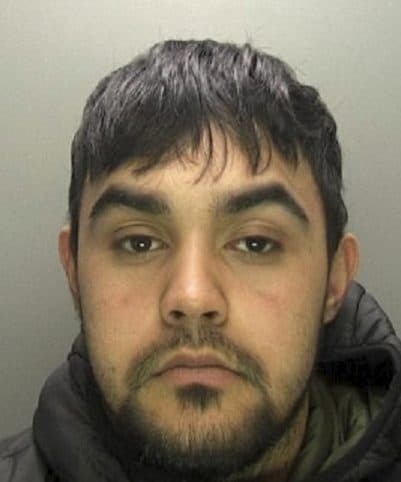 Anyone who sees Pace is asked to dial 999 or those with information on his whereabouts can dial 101 or Live Chat via WMP Online between 8am and midnight. Alternatively, people can contact Crimestoppers anonymously on 0800 555111; callers won’t be asked for their name and calls cannot be traced.